* just some light jump drills to get some speed. i feel my ankles starting to get sore. need to build up volume again. not used to impacts of landings. 3-4 weeks of these with volume and intensity cycling will get me jumping good again. will not max on jumps until im done with squat cycle. * SVJs and 3 step VJs ~ 32-36" touched both palm to the rim. standing 2 hand reach is 90". 30" for both tips of fingers to touch rim, 36" to get both palm at rim level. 38" to get both wrist at rim. * warm up set 325x4 paused was a lot harder than usual. 365x2 paused was not so bad. * single 405 workset was very hard 9/10. im into regression. cannot recover fast enough from multiple 405s. was planning a single or double 405 but i was not expecting it to be this tiring. i had to fight to get it. don't know if i set myself up good for the next workout. * im getting the depth jump effect nicely though. ankles and knees feel solid and tight whenever i do some form for quick movement. * BW at gym 192.8lbs. im not going to make 405x4 2-4sets without getting bigger legs (target ~194lb morning weight, 196 gym). i was strong for the 405x4 first set. stronger than last weeks. the 2nd set of 405, 3rd rep was not very hard but i would have burned out badly IMO if i pushed for 4 at this skinny weight. i will get stronger little by little if i maintain this plan but upping my weight would be easier and faster. * the 3rd set at 405 really showed me im not big enough to rep it consistently. a 3rd rep would have been an 9-9.5/10 lift. no chance of 4 rep there. * the paused 365 2nd rep was already a 9/10 lift. 3rd rep would have pinned me. * change of plan. need to go maintenance on sunday/tuesday while eating a little more carbs. 3cup/day to 3.5 along with more proteins. * weekly depth jumps and jump drills tomorrow. im not getting DOMd as bad for the last couple of weeks due to low tonnage, im just burning out overall due to too much intensity/effort to make my 405reps. can't really squeeze out too much out of 192lbs. * too much effort keeping track of the sets.. i just do it until i feel like my legs are not explosive anymore. * waved depth jumps focused on quick transitions and good landing absorption.. not max height. why awesome? made that 18's feel like complete cake? How much Vitamin S would you recommend per day? Is there an overdose? What are adverse effects? 18" DJ after a set at 24" makes force absorption and quick transition feel a lot faster and more solid. * 405lb squat not very heavy today. 405x1 a 7.5/10 lift. BW at 194lbs (192.8lb empty). i was at 196-198 on wed-thurs.. probably due to extra liquids. weight stabilized back to 194ish. thought i would be 194in the morning by now with all the steaks i just ate. 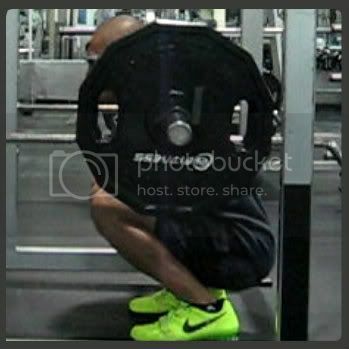 * even with a heavier BW, im not able to progress workout to workout on my squat. i would really fight to get 3 reps on 405lb today, probably all out on rep3. either im just not as fresh (work thurs-sat) or i haven't recovered yet from last tuesday squats. todays x1 is good warmup for tuesday. * jumps were not so bad. 18/24" depth jumps for 4 weeks now is getting the muscles on top of my knees stiffer. takes more effort to stretch. not doing extra static stretches because a stiffer muscle make jumping at lot easier. * will attempt 405x4 2-4 sets on tuesday followed by depth jumps 18/24 2-4reps x 8-10sets weds. How's your posture? Like you know, anterior tilt or posterior tilt or natural tilt? Any stiff muscles or overly flexible? ^ normal. flexibility is above average. can press upperbody/head on quads on hurdlers stretch. * am BW 193.5lb. 405 2nd set, rep 4 a 8.5/10 lift. 405 set 3, did not bother going for rep 3. transition speed noticeably slower. lower back will take a beating if i push for rep3. * back up paused reps 365s a 8.5-9/10 lift. no chance of rep 3 in either sets. * ramping up depth jump volume tomorrow, 405x1 on sunday with some DJs, and another attempt at 405 4x4-6 next tuesday. wont even bother going 405 x4 2nd set if i dont feel stronger than today.